Bottlebrush (Callistemon spp. ): growing, planting, caring. Cylindrical, brush like flowers - hence the name! Scientific name : Callistemon spp. Callistemon - bottlebrushes - is a genus of shrubs in the family Myrtaceae, endemic to Australia but widely cultivated or naturalized in many other regions. Their name comes from their cylindrical, brush like flowers resembling a traditional bottle brush. They typically favour moist conditions, so when planted in gardens thrive on regular watering, but some species are more drought-resistant than others. Callistemon are Australian shrubs with simple leaves, alternated, lanceolated or cylindrical, evergreent. The floral stems look like cylindrical brushes that are often red or pink, sometimes white. Callistemon are shrubs that for the most part fear heavy frosts bellow -8 ° C. If winter is cold in your area, plant in a bin or a pot to be able to shelter it in the winter. In open soil, plant in cool soil but well drained, neutral or acidic, fertile, and in the sun. Make a hole 20 cm larger than the root ball, by separating the different layers of the soil, then put some sand at the bottom, and put back in the hole the earth extracted from the bottom. Arrange the shrub so that limit between roots and stems is at ground level, then put back in the rest of the soil and keep a hollow for watering. Tamp regularly with your foot and water to fill the hollow completely. In pots, plant in a very fibrous soil or in an enriched compost of leaves. Add some sand. Use a large pot - at least 40 cm - for the first year of cultivation. Place it in the sun. 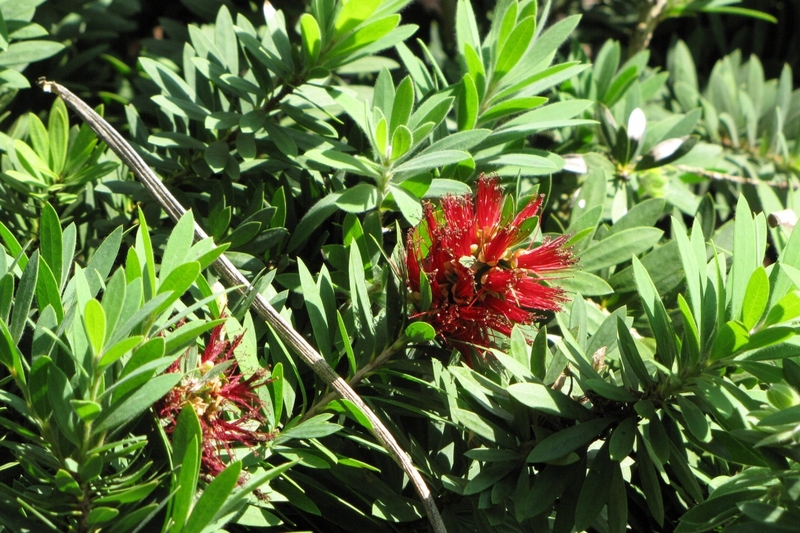 Callistemon is an Australian plant from moist, drained soils. In pots, it needs regular watering. During the growing season (spring, summer), watering must be regular - about twice a week. In the fall, space the waterings until winter when a single watering twice a month should suffice. If you never trim it, the Callistemon can quickly become slightly shaggy, so cut off the dead woods and unsightly stems - it means stems that "that go across or come back in" - during winter. To help flowering, you can prune the flower stalks after flowering, during summer but this is not essential. 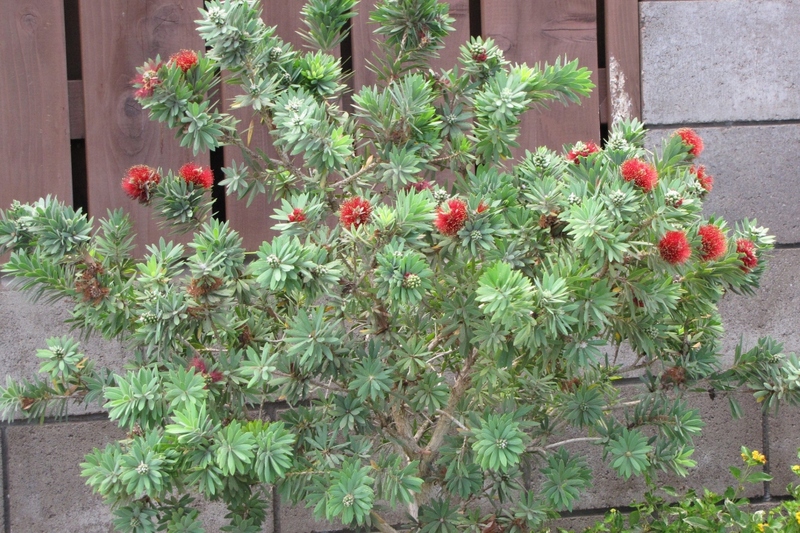 Once a year, add some compost at the bottom of your Callistemon's - November if it's fresh, March-April if it's ripe. If you do not have any compost, put some potting soil in March. At the end of winter every 2 years, repot your plant in a slightly larger pot, adding sand, garden soil and potting soil. In late summer, take a few branch ends with two leaves that you cut in half. Plant them in water or in sand, wait a few weeks for roots to grow, then transplant into a mixture of sand and earth. Watch out for red spiders, mealybugs and shield mealybugs, especially in the greenhouse. Cleaning with some black soap usually does the trick. 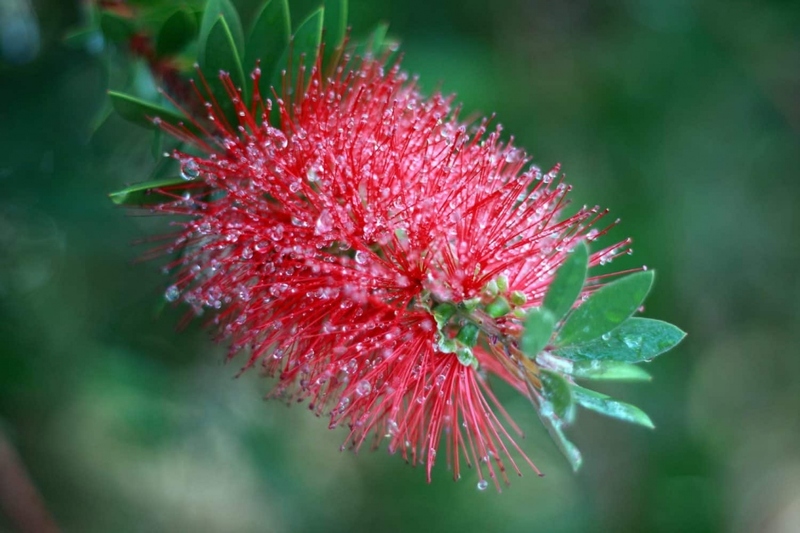 In areas where frost may occur, place your callistemon in a cold greenhouse. You should water it once or twice a month. If the wood freezes, it can grow back from the rootball but it is necessary to wait at least 2 years before seeing it bloom again. Your callistemon placed in a cold greenhouse for the winter will need to stretch its legs! Mulch at the bottom of your Callistemon in April with some crushed wood that will limit evaporation during the summer.